Let's get it going !!! We got us a small but good core group here. Let's get on with the business of discussing our projects and ideas. I have expanded the storage capability of the Gallery so there is room for at least 300 pictures now. I have to tell you that the gallery function here is quite different than what we are used to but I am sure we will learn to use it and adapt to it. I have removed all restraints on posting so there is no waiting to get your post approved. lowlid has been experimneting with it a bit so he may well become our expert on this gallery thing. You won't need the gallery if you just want to post pics. You can do it in any thread you post so don't be bashful about it. I would like to see some threads started on builds. we can all learn from each other. I intend to start a build thread when I get started on my first '53 F-100. Right now all I have is pictures of stripping down the trucks and donor vehicles, which araen't much to look at unless they are mixed with actual build pics. I intend to limit my effort to spread the word for the next two weeks in order to give us some time to get used to the board and get some stuff going. Hopefully after a while this thing will take on a life of it's own and evolve in ways we can't at this point imagine. It goes without saying, there is alot of room for improvement here. I am not in the least bit opposed to any suggestions to make things better. Any ideas you have I am open to. If we need more or different categories I can get them in. I can't say this enough, this is not my board, I just started it. It belongs to those who participate in it. if you have ideas and suggestions, PM me about them. OK Folks, here's the deal... I went to a lot of effort to put just about every category in here I could think of that Darksiders would have anything to do with. You can't tell me you folks don't do any of the other stuff besides paint and body work. Nope... not buyin' it.. The heading for this thread is WANTED POSTERS. That's not as in posters of wanted men. It means we want posters... You know, people to post pictures and descriptions of their work. I know you guys got it in you because I have read the endless threads you have done on the FTE. Even if you just did some lille trick to your ride, tell us and show us. I'm sure the response will be far more satisfying that the "That's nice Honey", that you will get from you wife or girl friend. Some stuff I'd like to share. Hey y'all. Yeah newbie here. I'm a photo-journalist in the motorcycle world, but I'm such a nut case for Rat Rods, Hot Rods and beautiful classic cars that I have decided to expand a bit into your realm. I have an album of photos I've just started to collect. 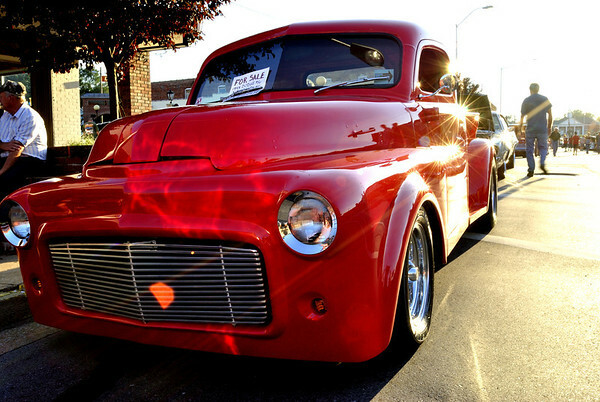 These photos are from the Cruise In in my home town of Elizabethton, TN. Due to light restrictions and shadows, I didn't collect all the beauties that lined the street, but these are the ones I figured would/could be captured with some dignity. I'd be happy to have y'all come and take a look. Oh, I'm new so I can't post the address of my smug mug album account. I'll wait a week, but at least you can see one of the photos, eh? Re: Let's get it going !!! Man am I ever glad to have you here on the board. I started this mess two years ago and it has been slow to start but I see things are finally starting to pick up with a few guys coming on every month. Love the picture... We have no restrictions on number of posts to get privledges or time on the board. If you have already looked around you have probably read our Five Simple Rules and you know we are pretty liberal here. We're all about the builds and doing stuff chep but good with lots of creative talent. I'm looking forward to seeing more from you here.